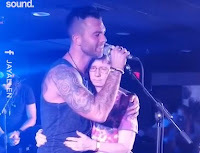 Jay Allen Sings to His Mother On-Stage, Sharing His Thoughts and Feelings About Her Alzheimer's. Click the speaker in the video's lower right for sound. Thank you for sharing this beautiful, heartfelt song of love, desperation, support, and strength. Words so well put together. Love from mother to child, child to mother. Thank you.